I thought it had been a while since I posted anything about our experience with the Tower Garden and our efforts to grow our own fruits and veggies, but then I realized I haven't posted anything about it at all. It seems to happen frequently with me that I intend so much to do something that eventually I assume it already happened. That excuse doesn't get me very far at work or with family. However, before I get into that I have a few brief updates and shameless self promotion to bore you with, so thanks in advance for bearing with me! First and foremost, I am honored to have had an article posted by MindBodyGreen.com. If you haven't read it already, here is the link. I am truly grateful to have had my article published on a site ripe with talent and expertise. MBG is a great site because it reaches broadly across many aspects of health and wellness, and presents itself in a positive, uplifting, and inspirational fashion. With so much negativity on the internet, it is a welcome oasis, and it is my goal to exude the positive on this site as well. Thanks to all who have read the article and have found this site as a result. Welcome! Second, I have made a lot of progress on my swimming as of late. Today I woke up at 4:30 am to do an iron distance (2.4 mile) swim. This is the longest distance I have ever swum, and psychologically one of the most significant milestones to surpass (one of the others was swimming in open water). When I first began seriously swimming (not just swimming to get back to my surfboard, or showing off in front of the kids), it was intimidating to think of swimming a few hundred yards, let alone over 4,000. I was frequently out of breath after a few laps. I could not even fathom (unintended pun win!) doing a non-stop 2.4 mile swim. But the power of persistence pays off, and I achieved that today. To get beyond our negative perceptions, and the "I can'ts" running through our heads, we need to break through a number of barriers, physical and mental. For me it was slowly increasing the yardage while swimming through the intimidation. Where once I was standing at the end of a pool intimidated by the idea of swimming 2,000 yards, I can now confidently do more than twice that, and 2,000 now appears easy. Our perception about certain challenges (in this case distance) begin to change as we break through barriers. One additional note on the swimming. In the beginning I had resigned myself to the fact that I would likely not be able to swim any significant distance at a pace under 2 min/100 meters. After all, I am a "sinker" with a bad shoulder. However, today I completed my swim at an average pace of 1:45/100. So now to switch gears completely and break all the rules taught to me by my writing teachers (well, I guess I've already done that many times over. Especially with my overuse of parentheses), I'm going to talk about something completely different. Home grown food. With the idea in mind that we wanted to source our produce locally, we began getting a weekly delivery from a local organic farm (as described in "So THAT's a Parsnip... Do You Eat It?..."). That has been working well, since it is affordable and abundant, but there are some shortcomings. First, we get whatever is given to us. This is okay in theory, but it also turns into a lot of uneaten potatoes and ears of corn in our fridge. Also, sometimes the fruits or veggies go bad before we have a chance to eat them. Therefore, we came to the conclusion we should begin growing some of our own. 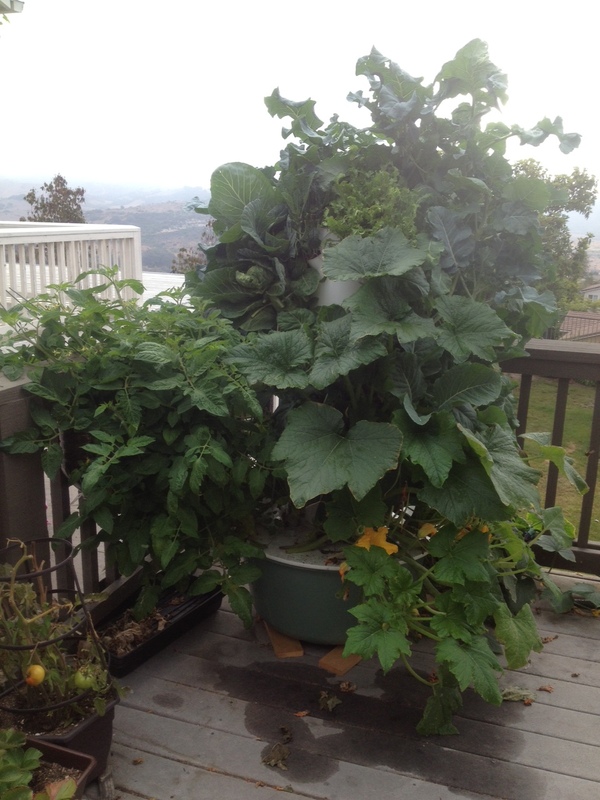 Besides, you don't get more locally grown than in your own backyard! The Tower Garden was our first purchase. Essentially, it is a hydroponic system that provides water and nutrients via a pumping system. 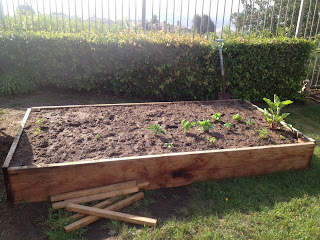 We set it up and began growing veggies in early June. Here is what it looks like now. What you can't see is the tower itself as it is covered by a tropical rainforest of monstrous vegetation. We had about a 80% success rate with the seedlings, and have thus far been able to harvest chard, kale, two kinds of lettuce, cucumber, squash, and zucchini. Still yet to bear fruit we have tomatoes, lima beans, brussels sprouts, and broccoli. The produce is delicious and fresh, as we cut it off right when we need it, and it has thus far been plentiful. A few weeks ago, we increased our production capacity of veggies by building a raised garden bed. The dimensions are 4 ft by 8 ft, and the total cost to install was just around $250. The cost was definitely justifiable, but the undertaking was proven to be most adventurous. We needed a little more than a cubic yard of soil to fill the thing, which put us in a tricky situation. The local supplier of organic soil mixes would not deliver a quantity that small, so we had to pick it up. There were a few things I underestimated when I thought of left to pick up a cubic yard of soil. First, it the company was located quite a ways up the Ortega Highway, probably about 45 minutes away from home. Second, I didn't realize how much a cubic yard of soil actually is. This was made abundantly clear when the bulldozer dropped the atomic load into the rented U-Haul truck. The F-150 quickly turned into a low rider, and I became terrified that I may become the not-so-proud owner of a broken down U-Haul. Fortunately, the Heavy-Duty did it's duty and made it home. Finally, I underestimated the amount of time it would actually take unloading the material. It took me a solid two to three hours of digging and dragging to get all the material out of the truck and into the garden bed. Lesson learned, it's always best to outsource this work to the experts. I was grateful that I was able to clean the truck out completely and return it in one piece! 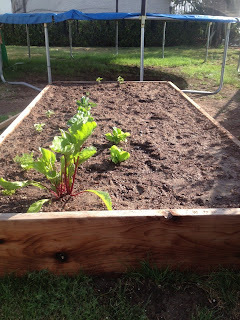 After a couple weeks, we have some growth in the garden bed with room to spare. 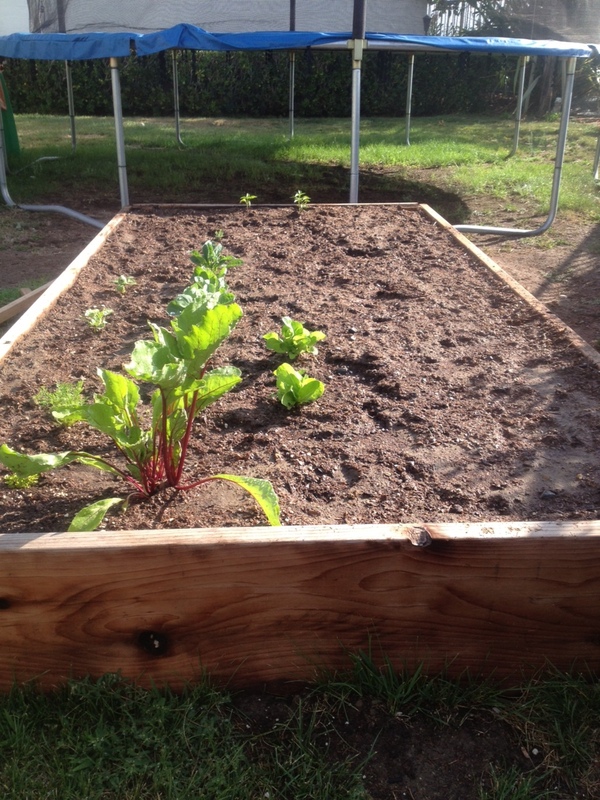 We have pinto beans, beets, carrots, and kale. We haven't harvested it yet, but it's doing very well, and I'm fairly proud of the results. While the initial costs of installing the Tower Garden and the garden bed was pretty steep, I believe that within a year, once we have a good rotation of veggies growing in both, we will break even and then begin saving money on produce. Additionally, our veggies will be fresher than anything we have ever purchased at a store, and we will have the satisfaction that we have benefited from our own hard work. I don't want to sugar coat it, it's important to note that it is not easy to be self sufficient with regard to growing all our own food. On the contrary, it takes a lot of time, energy, and planning. It requires us to plan the seasons so we know what to grow when, it requires that we replace the water and nutrients in the Tower Garden multiple times per week, and that we keep those pesky varmints away. But like anything else, it's mostly a change in behavior. It's all in the question of what's most important to you? With everything we choose to spend time on in our busy lives, what many of us choose to put at the back of the list is health. Many of us spend little or no time looking at where our food comes from, how it's prepared, or even how long it's been on the shelf (or how it's even able to stay on the shelf that long). When it comes to our health, nothing can be more important than what is going into (and thus what is affecting) our bodies. A little extra work can make a world of difference. Until next time, be in good health!